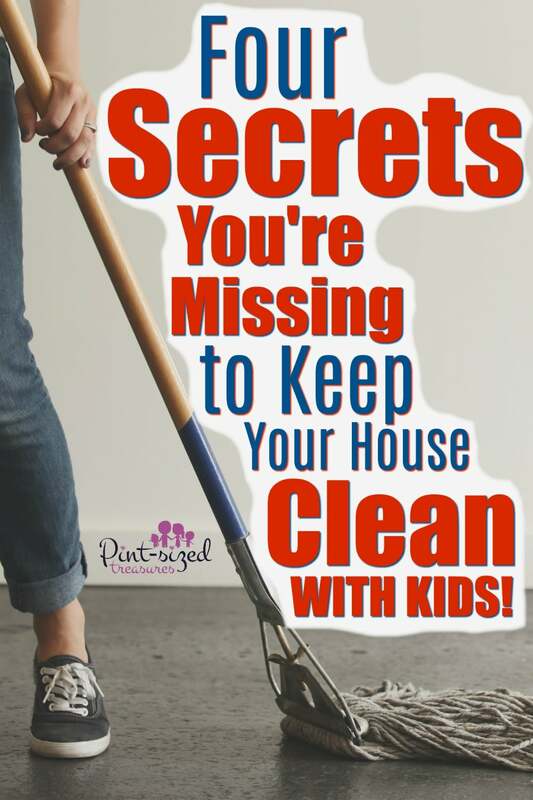 Home › Parenting › 4 Secrets You’re Missing to Keep Your House Clean — With Kids! Got Kids? Want a Clean House? Here’s Help! Has someone ever said this to you? If not, you’re probably missing these four secrets that keep a house clean — even when you have a lot of kids! I’m one of those people who dislikes the automated, “Oh…nothing much” answers to those questions. I try to answer the question with an actual answer. And you know what my answer was 85% of the time? But I learned much, much later that yes, having kids does require more clean-up, but it doesn’t require 12 hours of clean-up per day! Once I learned how to follow these four secrets it kept a house with MUCH more kids in working order. Maybe not perfectly polished, but clean? Yes. But ONLY when I follow these four secrets. If I don’t put these sneaky mom secrets into practice, the house can fall apart in just about 15 minutes. It happens to all of us! At first this rule seems harsh, but in reality it’s not. My kids have plenty of room in their bedrooms to play toys. I remind them that our entire house is not a toy box. I repeat: our entire house is not a toy box! If you have a baby under the age of 12 months old, then by all means break this rule and let your baby enjoy some activity time on a blanket with a few of his favorite toys. But kids that are older? They can play happily in their rooms or in a toy room without trekking toys throughout the kitchen, laundry room and anywhere else there is space to stretch out and race cars and trains. Hey — no more tender feet getting sideswiped by tiny lego pieces! Honesty disclosure: I do make exceptions when a brilliant kid comes up with a genius toy hack like this one. It still keeps the house clean, so this is pretty much the only exception to this tidy house rule! Keep your kids and yourself on regular, daily clean-up routines. My clean-up routine is simple. And I love this clean-up routine for working moms! We clean-up after breakfast lunch and dinner. We also do one more cleanup round before bedtime. And we also have house swoops…which are super-quick, clean-ups throughout the day. We created a toddler, tween and teen swoop list you can print out and start using today! Keeping clean-up on a routine will keep everyone moving towards creating a clean home! Allow no leisure activities until the house is clean. It’s kind of my pet peeve to see families lounge around when there are piles of laundry, dirty, sticky floors and a sink full of dishes. If you don’t deal with the mess NOW it will still be there after you unwind. And what typically comes after unwinding? And then the morning comes and you’re rushing out the door to work and school. Rinse and repeat…and you’re left with a very untidy house that becomes extremely overwhelming. We have an unspoken rule around our house (because it’s been spoken for YEARS…ha!) that if kids want to play outside, watch a movie or just have lazy, leisure time it only comes when the house is tidy! That keeps us all focused on our individual tasks. Plus, we all have something driving us to hurry up and stay focused! When we’re done cleaning, we can relax, unwind and play…in a CLEAN house! Again…not perfect, but clean! Oooh…and if you want to know a secret to getting weekend chores done in a FUN way (because that’s when our family really scrubs the house), then check out my genius tip to make chores fun for kids! It’s simple! If you are having a difficult time getting your kids to do their part, here’s a sneaky tip that always works at our house! For every personal item (shoes, toys, books etc.) that is not put away, the owner of that item gets 15 minutes off of his/her bedtime. This keeps the living room and other rooms from being a “drop everything” area.It’s amazing how kids start picking up after themselves when bedtime is at stake! 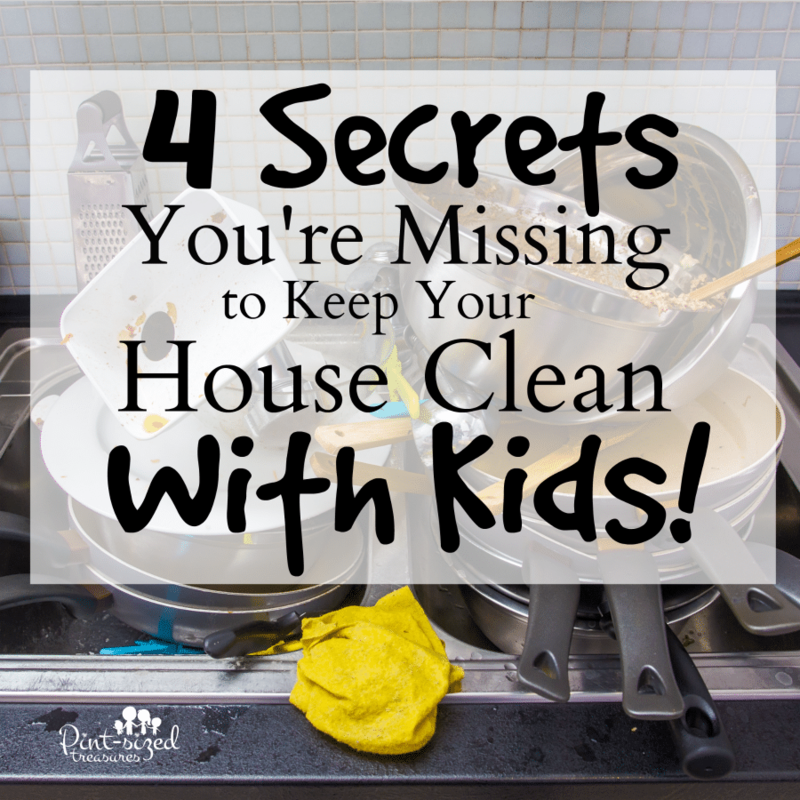 Are you struggling keeping your house clean because you have lots of kiddos running around? Let me know how these cleaning tips work for you! 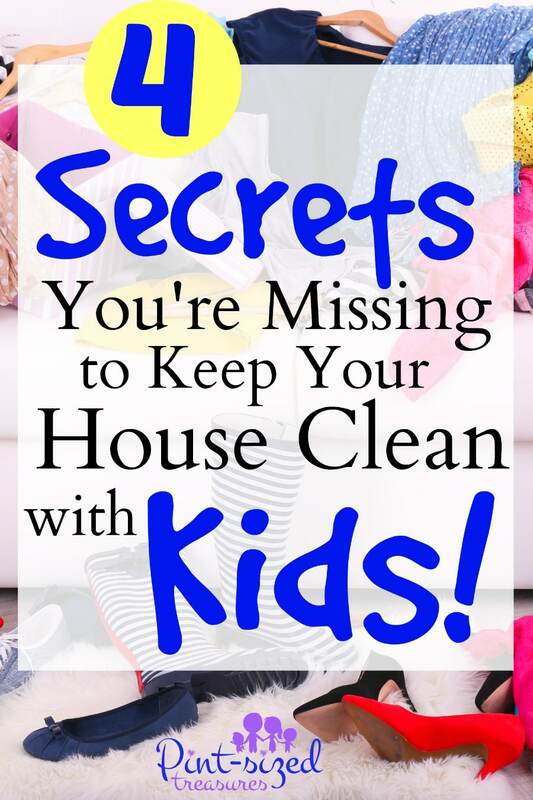 Did I miss any secret tips your family uses to keep the house clean? Share them with me on Facebook!